Metallic coatings make very broad bandwidth reflectors. Usually it is best to protect the coatings with a durable dielectric layer as they are very soft and susceptible to scratching. The efficiency of metallic reflectors falls off at shorter wavelengths but this may be enhanced by the application of a multi-layer dielectric thin film stack. The table shows the reflectance. of each of the metals without any protection or enhancement. Protected metallic coatings have a dielectric coating layer over the metallic layer to protect the coating from being oxidized in the air or from scratched. For enhanced metallic coatings, a stack of dielectric layers are added on the metallic coating to increase reflectance for a particular wavelength range. 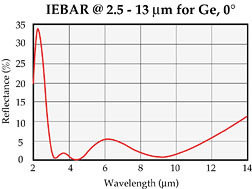 Infra-red broadband anti-reflection coatings are offered for the two broad spectral passbands of 3 – 5 µm and 8-12 µm. Coatings are designed for the refractive index of the substrate so it is necessary to offer separate coatings for different substrate materials. Standard coatings are offered for Zinc Selenide and Germanium. 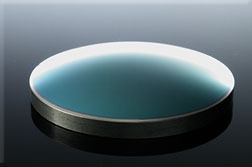 These coatings are highly durable and can be cleaned repeatedly using normal optics handling techniques. They are suitable for high power laser use such as that emitted from a CO2 laser. These extra-broadband coatings work effectively over the entire useful IR optical spectrum from 2.5 to 13 µm, except for the silicon coating which works only over the passband of silicon (2.5 – 5 µm). They are useful for imaging applications including imaging with dual passband systems. 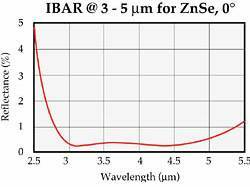 They provide an average reflectance of less than 5% over this range. This does not put them in the category of high performance anti-reflection coatings but when broad bandwidth is essential they provide a good overall transmission. The coatings can be adapted to either normal or 45° incidence so please specify the intended angle of incidence when ordering. It is also helpful if you specify the major wavelength of interest so the coating can be tuned for best performance at that wavelength. These coatings are highly durable and resistant to laser damage and can be used with CO2 lasers. They may be cleaned repeatedly using normal optics handling techniques.